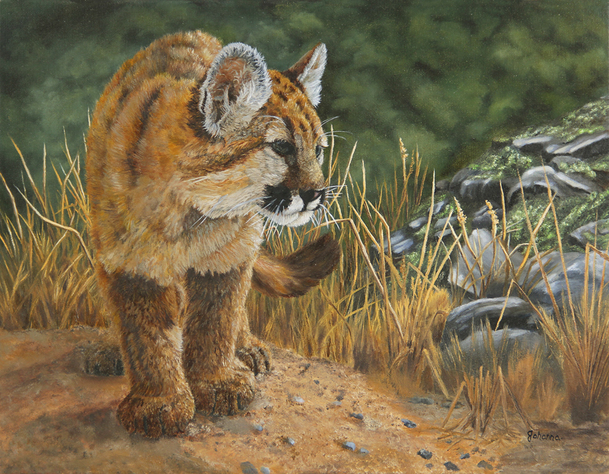 This painting of a cougar cub was inspired by a photo I took of Lulu at 3 months old at the Animal Adventure Park in Harpursville, NY. I was inspired to paint Lulu as if she was exploring her natural habitat for the first time. Cougar cubs usually stay with their mothers for the first 18 to 24 months of their life. Cougar dens can be found in rock crevices, overhangs and even low vegitation with no bedding.